Nigerian Navy discovers six new illegal refineries with combined capacity to refine four million litres of crude oil daily in Alakiri, Rivers state. Imagine the revenue that Nigeria can generate from refining four million litres of crude oil daily. That is a lot of money and all of it is going to the owners of the six new illegal refineries discovered in Alakiri, Asari Toru Local Government Area of Rivers. Capt. Victor Choji, Executive Officer of the Nigerian Navy Ship (NNS) Pathfinder Port Harcourt, led his men to destroy one of the illegal refineries on Thursday in Alakiri, Asari-Toru. “The refinery (in Alakiri) has capacity to produce one million litres of refined petroleum products daily, while the five other refineries have production-capacity of three million litres daily,” he said. Choji said the refineries were discovered through intensive intelligence gathering and undercover operations by naval troops. He said the Navy deployed Swam Buggy machines to crush the metallic storages and its pipelines to make it impossible for operators of the refineries to rehabilitate the facilities. “This operation is focused on hitting the very heart of their infrastructure, so that the operators do not have capacity to regroup and resume their illicit activities. “We realised that whenever we set ablaze the refineries without the use of Swam Buggy machine, days after our troops leave the scene, the oil thieves return and revive the refineries. “So, the Navy came up with this strategy to ensure that the pipeline network and metallic storages at the illegal facility are completely crushed,” he said. The executive officer said the swam buggy approach was also adopted to address health concern raised by residents over carbon emissions (black soot) in the atmosphere in the state and environs. 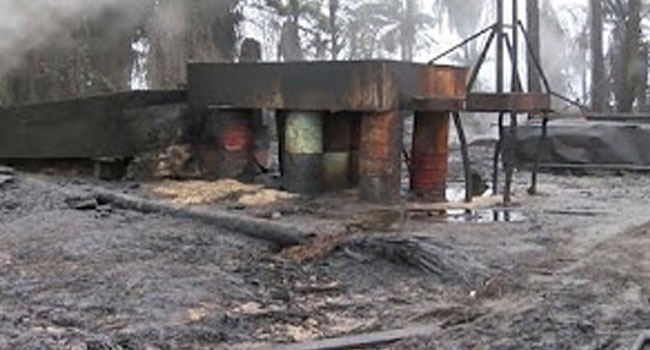 It would take troops about seven days to move the petroleum products and destroy the six illegal refineries.